I am officially on the chalk paint bandwagon. In fact, if I could, I would drive that wagon. I am obsessed. 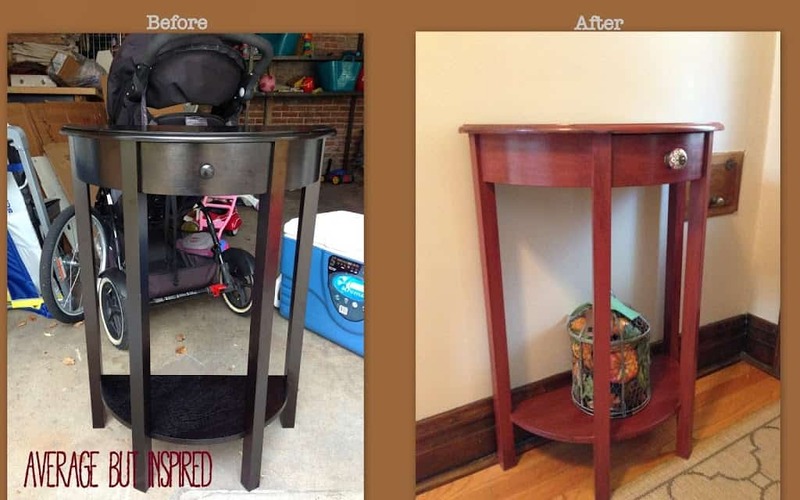 I am already thinking about my next chalk paint project, but for now, here’s a before and after of my first. This all began a few weeks ago when my husband was in Las Vegas for his fantasy football draft. (Yes, I banked about five gazillion points for this one). With the kids in bed and nobody to talk to, I decided to go on a Pinterest binge. Some amazing chalk paint projects caught my eye that night, so I decided to watch a few tutorials on YouTube about how to use the name brand chalk paint, Annie Sloan. After that, I researched the product and found that it is extremely expensive and rather difficult to locate. This seemed strange to me because last year, my mom gifted me with some gorgeous chairs that she had refinished with chalk paint, and my mom is not the type to spend a ridiculous amount of money on paint or supplies. 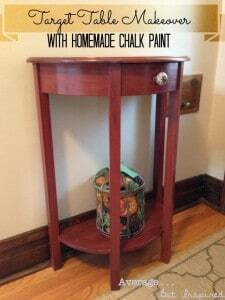 Perplexed, I called her and found out that YOU CAN MAKE YOUR OWN CHALK PAINT (as she did for my chairs)! Add this to the long list of reasons why my mom is amazing. So anyway, I did some more research on Pinterest and found that there are a few recipes for homemade chalk paint floating around. Luckily, an amazing blogger named Patti, who writes at Old Things New, tested all of these recipes and declared which is her favorite. You can read her entire post here, but Patti’s favorite recipe for homemade chalk paint is as follows: 2/3 part latex paint; 1/3 part calcium carbonate; a little water. 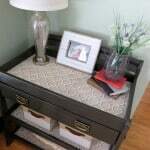 With this easy and inexpensive recipe in mind, I knew I had to get to work on revamping my cheap-looking foyer table from Target. The black finish was not working for me and its straight lines made it the perfect piece for my first attempt at chalk painting. The best thing about chalk paint, in my opinion, is that the only prep work involved is mixing your paint. You don’t sand the furniture, prime it or anything! I always want to get right to it, so eliminating the tedious prep work is fantastic. With that said, after I had my first coat of paint on the table, I was terrified and my husband was pi**ed. It was pink, streaky and ugly. Uglier than before. I hadn’t mixed my paint and calcium carbonate enough, so I had little white bumps all over the place. It looked really bad. So if you do this, make sure you mix mix mix mix like there’s no tomorrow. Once the first coat dried, I lightly sanded the bumps off and put a second coat on. Thankfully, it looked much less pink and more red once the second coat dried. The next day, I lightly sanded in areas such as leg bases and around the top of the table, in order to give it a more rustic look. Then, I used a wet rag to wash off any sawdust and make sure it was clean. 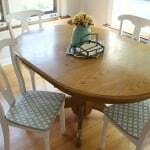 Next, I used my stencil brush to apply a thin coat of the SC Johnson Paste Wax to the entire table. Although the wax is stinky, it is strangely fun to apply. After about half an hour, I used my lint-free rags and got to buffing. This was hard work, but well worth it. The table began to shine. Unfortunately I forgot to take a picture of it with the first coat of wax. I let the table sit overnight and then applied some of the Briwax dark wax with my lint-free rag in order to give the table some more character. I was a little aggressive with it and probably applied too much, so next time I will use it more sparingly. In any event, once the Briwax dried (also in about half an hour), I used my lint-free rags to buff the heck out of my table. 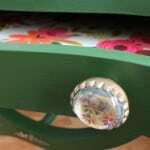 Then, I even used the drill to make a bigger hole for my new drawer pull. I’m so happy that my foyer now has a pretty piece of furniture to welcome visitors. Of course, now that the table is refreshed, the rest of the space needs to be updated, too . . . I just might have to cash in those bonus points earned during my husband’s Vegas vacation for that! Stay tuned. . .
Oh girl… We’re in this together! Wow! Looks so professional! Great color choice. What do think will happen if you use a latex with a sheen to it, instead of flat? Nice job. I guess I am not alone in being slightly nervous about making and using chalk paint. But I am with you. I can’t bring myself to pay for the high price of chalk pain. I have an old wooden chair with good bones, given to me by my landlady that is perfect for a chalk paint makeover. I think I am going to just jump in and do this.